MARY LOU MCDONALD is faced with no small task. Making her mark as president of Sinn Féin in the three and a half-decade-long shadow of Gerry Adams must be a daunting task, particularly for a Dublin-based figure one step removed from the core republican legacy. The lack of IRA baggage may prove to be both a blessing and a curse for this new leader, but with a century of party history behind her, McDonald is treading a well-worn path, hoping that one last push can secure a seat of power in both Belfast and Dublin, as well as a united Ireland. McDonald has not been without controversy, however, with her use of ‘Londonderry’ dividing opinion. Some see it as a treacherous act for a Republican, but party colleague Catherine Nelson argues it is a way of reaching out to unionists, who must be included in any future united Ireland. This, along with Sinn Féin’s support for the new unionist Senator, Ian Marshall, is intended to accommodate unionists as the party moves closer to its goals, but it is no radical departure from their legacy. The republican movement is very much concerned with its history, continuing the struggle so those who have fallen will not have died in vain. This history provides a ready supply of strategies and tactics, tried and tested, from which to choose. Abstentionism is one of these. First developed into policy by Sinn Féin’s founder, Arthur Griffith, in 1905, based on the Hungarian example, abstentionism was intended as an alternative to both the physical force of the Fenians and the parliamentarianism of Redmond’s Parliamentary Party. Such a policy continues, barely altered, today. Pre-republican Sinn Féin’s early attempts to distinguish itself from its nationalist rivals continued as the party’s Republican wing, associated with the likes of Seán Mac Diarmada and the Irish Freedom newspaper of 1910, grew in influence. This wing sought to address the concerns of both workers and unionists, seeing Britain’s economic suppression of Ireland as a common thread binding both Protestants and Catholics, Unionists and Nationalists. When, in 1912, unionists armed themselves in response to proposed Home Rule, it became clear that their fears, justified or not, must be addressed. It may seem odd, now, to think that Sinn Féin would have offered their solidarity to unionists standing up for their rights against the interference of the Westminster Parliament. However, there was a recognition that for both unionists and nationalists, partition would be unacceptable. The similarities between now and then are striking. Robert Mitchell Henry, a Professor of Latin at Queen’s, Belfast and a contemporary of these events, described in his 1920 book, The Evolution of Sinn Féin, the controversy surrounding unionist recruitment marches through Catholic and nationalist areas during the First World War. Additionally, unionist opposition to the proposed Irish language act has been argued along much the same lines as the opposition to Home Rule a century ago. Arlene Foster has made clear her concern that a standalone Irish language act may “impinge on the rights” of those who do not speak Irish, much like unionists were concerned the rights of non-Catholics would be threatened in a free Ireland. 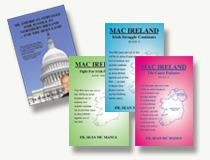 Given the constant reference to history in Sinn Féin policy, whether in terms of justification or content, and the historical parallels to today’s divides, it should be no surprise that McDonald is moving to accommodate unionists during a bitter deadlock in the Northern Irish Assembly, nor that she would support the candidacy of a unionist in an all-Ireland Seanad.